Has anyone tried using a pusher or puller fan on a condenser? I’m considering adding one. The gap between condenser and radiator is very small. A pusher maybe the only option. Two issues with my truck. First, mine has an 88-91 front end. Second, it still runs an R4 compressor. Once the compressor fails, an upgrade is planned. A SANDEN HD compressor will replace the R4. The LS dual Camero fans cool the ZZ4 to keep temps between 190 and 205. The ideal ZZ4 operating temp is 195. The temp is too high for a/c. I do need to check R134 pressures. A trinary switch does cycle fans when needed. A165 AMP alternator powers everything. True. GM and Ford use straight air flow cooling. Newer models may be different. Dodge has separate fans for cooling and a/c since 2002. The condenser has a separate air path. Both my fans turn on either by temp or a/c pressure triggers. My truck runs a 454 thick radiator. When a/c pressures trigger fans, engine temps drop too. The R4 is not the best compressor. Maybe after upgrading, dual fan activation may work better for a/c. If not, a smaller condenser fan will cool R134 faster. I owned a 91 R/V style suburban years ago that had a pusher fan factory. Interesting. Was it diesel or BB? A bolt on would be nice. I’m going to check around on eBay. RockAuto does not list a condenser fan. Did it cover all the condenser or part of it? I’ll have to search or find a pic. With a pic, I would know where to place a 12” fan. Or the biggest I can fit. Cool! Found a part number! It’s on order. I’ll use a 100 amp relay to power it. I’ll remove the trinary signal to the dual LS fans. I’ll post pictures when it’s installed. It originally was a 6.2 diesel that I swapped over to gas and sold the boat anchor that was in it. It wasn't very large maybe 14-16 in diameter on the passenger side of the condenser . junkman104 thanks for the added info. The R134 condenser is cross flow. Having it on the passenger side is ideal. The passenger side is exit and entry for R134. The condenser fan arrived yesterday. I'm not too excited about the fan. I can hear it squeak. It's okay. What matters are the brackets. A 12" Spal can be bolted on later. Does anyone have a picture of their condenser without a grill? I found one for an 85 truck. Seems there are bolt holes there. Two on the center/hood latch brace. Two more on the passenger side. Next on order is a weather proof pig tail. Stay tuned for installation pics! That fan is different than the fan I have seen installed on the square bodies. 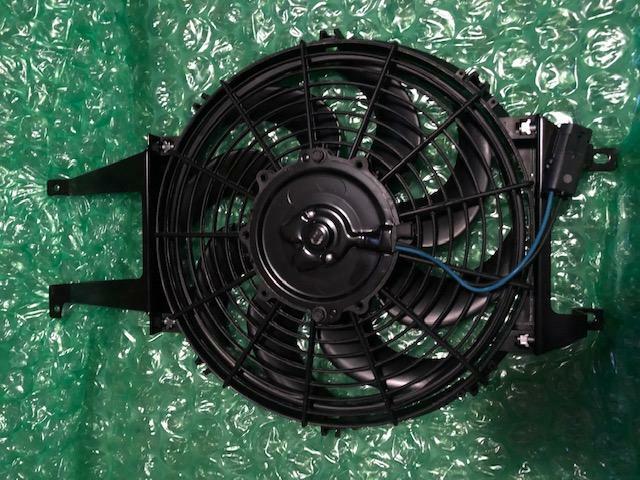 That fan is IDENTICAL to the fan that came factory installed on my 1999 GMT400 Tahoe. Part number crosses to '99 or so. C/K Pickup, 5.0 & 5.7L. 5.0 & 5.7L. 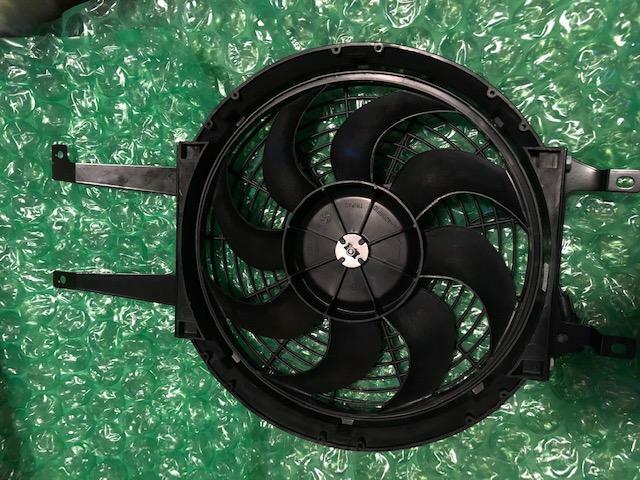 7.4L, ac condenser fan. 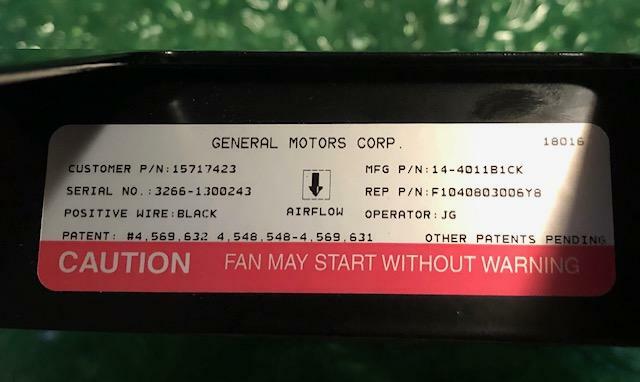 Notes:	Aux Fan For 1996-99 Listed As An Assembly Only. Edited by gchemist on 02-12-19 02:49 PM. Reason for edit: No reason given. Execution time: 0.136 seconds. Total Queries: 18 Zlib Compression is on.